This is a scalable context timeline. It contains events related to the event 9:04 a.m. September 11, 2001: NEADS Requests Refueling Planes from McGuire Air Force Base. You can narrow or broaden the context of this timeline by adjusting the zoom level. The lower the scale, the more relevant the items on average will be, while the higher the scale, the less relevant the items, on average, will be. 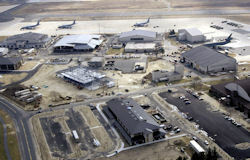 Fighters Told They Can Contact Navy Control Facility - The controller continues, “If you want, if you can’t contact me, you can go to Giant Killer on 338.1.” [Federal Aviation Administration, 9/11/2001] (“Giant Killer” is the call sign for the Fleet Area Control and Surveillance Facility in Virginia Beach, Virginia—a Navy air traffic control agency that handles over-water military operations. [New York Times, 2/10/1997; Spencer, 2008, pp. 143] ) The controller then tells Duffy that he can contact Giant Killer, because “you’re going through their airspace.” Duffy replies, “Okay, I’ll do all that, thanks.” [Federal Aviation Administration, 9/11/2001] The Otis fighters are then handed on to another controller at the Boston Center. Stephen Roebuck, who is working at the Hampton Sector radar position, now communicates with them. [9/11 Commission, 9/22/2003 ; 9/11 Commission, 2004] The Hampton Sector covers the area that includes the Whiskey 105 airspace. Pilots Unable to Give Specific Information about 'Hold' - Roebuck asks the pilots of the fighters if they know their destination. They reply no, and say they need to hold in the western area of Whiskey 105. Roebuck wants information on the position they will hold at in Whiskey 105, but the pilots say they cannot give a specific location. Instead, they tell Roebuck to keep them in a “published hold” in the area. Roebuck asks if the fighters want a “radial” or a “latitude/longitude” hold, but is told they will maintain themselves.